Voice recorder and playback module is a made for the purpose of recording those messages and playback which required frequently at some places like platform, train, instruction, mobile, etc. When I started to work on this project I was not able to find some easy instruction to made one for me. So I decided to put it on my blogs so that other can made this one easily. Now a my voice recorder module is based on IC ISD17XX/1720 which is DIP package and 2.4-5 volt operating voltage. It is a multi-message voice record. 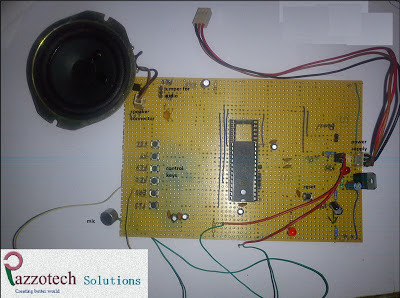 It can be operated standalone or by microcontroller(SPI) mode. Recording are stored into on-chip flash memory, providing zero power message storage. 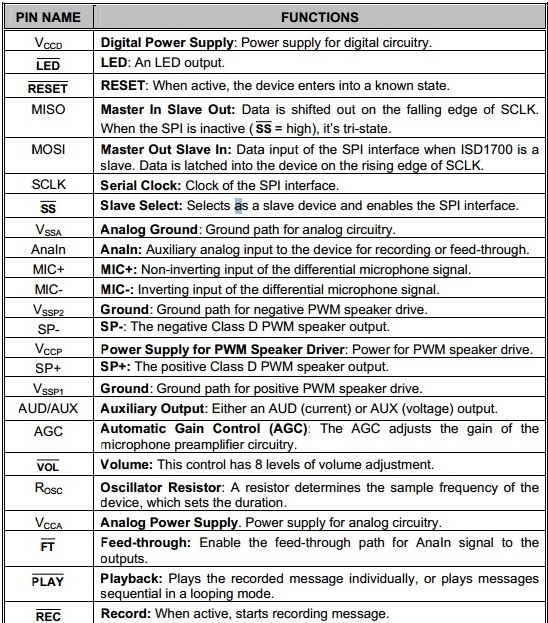 Modes of operation –There are two modes of operation Standalone (push button control) and microcontroller (SPI) mode. We can use this mode by REC,PLAY, FWD, Erase, VOL, RESET. To control desired operation. After completion of operation its automatically goes into power down mode. In SPI mode control of the device is achieved by 4 wire serial interface via SPI commands. INSTRUCTIONS- Here are some instruction which should be taken care at the time of using the module. · Play Back- To play back the message just press the button PLAY . Led will blink till message play. · Volume- To increase or decrease the volume press VOL button. · Erase – To erase the track just press the erase button. If want to erase all then press it for very long time . I need this ic . From where should i buy it? 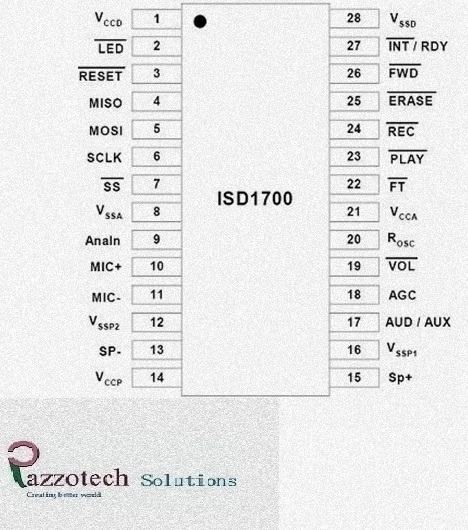 Hi, pins 1-28, 21-8, 14-16-12, are connected as they are in the schematic? After recording, i want to send this recording to another computer/server/software. So, how to send recorded message to another computer/server/software ??? I followed this tutorial. And when I connect the batteries, the voltage drops too as low as 0.50 volts instantly. the batteries as such show me 9V. l7805 gives a stable 5V. but the moment I connect to breadboard, the voltage drops. Can you guide on this ? voice recorder is a convenient and simple tool that can be used for audio recorder and voice recording. Their are many new features comes in voice recorder which help you in recording the voice.Heinrich limited provide high qualitative products of safety and technology.